"Back to the ship for lunch, and then into town on the shuttle bus to do some shopping. The bus went right to Dam Square, where hippies congregate on the shallow steps that surround the war memorial in the middle of the traffic circle. "Even in 1977 they had begin to look like the relics of times past. Little burned-out girls with their dumb doleful faces, sticky spill of hair, buttocks humble under the pale caked denim. Hairy desperado types, khaki and sweat, knapsacks and Aussie hats, their planned air of savage freedom compromised by an uncertainty around the eyes, a vague look, a listless way of moving. There was a constant motion, a shifting around, a perpetual slow investigation of one another, and among the hundreds were the old predators, trying to look young enough for credibility, and the very youngest victims, trying to look old enough to be with it, because this was one of the places of the world where it was all supposed to be: all the grass, all the badly played guitars, all the crotch crabs and stubborn clap and raggedy philosophies anybody could ever dream of. Each evening these drifters of the western world would slowly gather up their gear and obediently vacate their central refuge long enough for the local civil servants to hose the area clean with lots of high-pressure water. And then they would amble back to damp concrete, spread out once more and continue their endless investigations of one another." 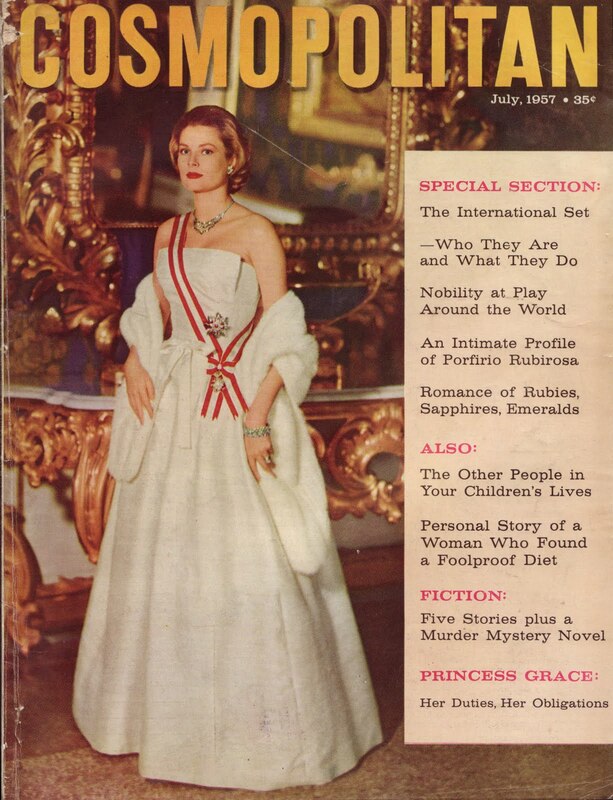 The shortest John D MacDonald story ever to appear in Cosmopolitan was published in the July 1957 issue of the magazine. It was submitted under the title "A Picture of Success" and clocked in at a mere 1,800 words. 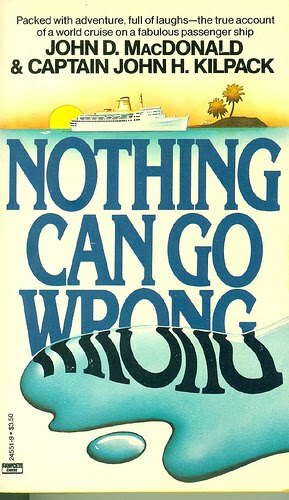 Cosmopolitan's fiction editor Kathryn Bourne eventually changed the title to "A Romantic Courtesy" -- an improvement -- and the story went on to appear alongside authors such as Harriet Pratt, Stephen Birmingham, Baird Hall and at least one writer whose name you might actually recognize, Bill S. Ballinger. 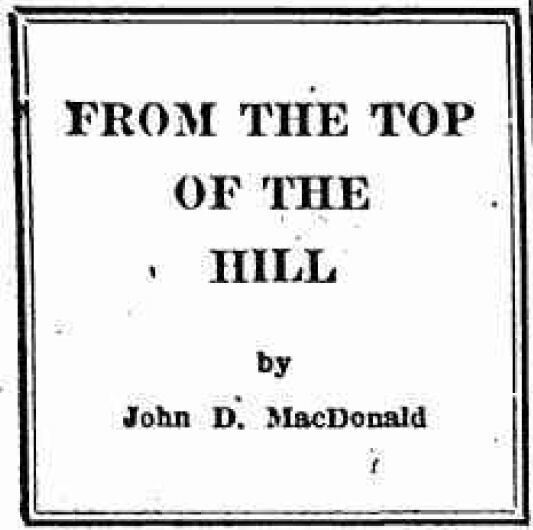 It was one of only four short stories MacDonald would publish that year, the same period he would produce five(!) novels and publish four (The Executioners was serialized in October and November of that year, eleven months before it hit the bookstands). "A Romantic Courtesy" is one of the author's non-crime pieces, a "mainstream" work of fiction that focuses on human relationships and behavior, that region MacDonald called the "little areas between the myths." In this particular case it is that area between desire and action, and between contentment and regret. 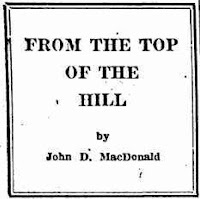 MacDonald uses a favorite structural template in "A Romantic Courtesy," one he had been using at least as far back as 1949 (see "The Anonymous Letter") wherein the protagonist has a random and unexpected encounter with someone from his past, initially sparking a flashback -- deeply rich in the details of time and place -- where some kind of unresolved conflict is introduced. Once the flashback is completed the reader is returned to the present where said conflict is resolved, usually employing some kind of literary twist. John Raney has it made. The thirty-five year-old Texas rancher lives on twenty-six thousand acres north of Fort Worth and is married to a pretty blonde-haired woman named Betty who has given him three husky boys. John made his money in oil and horses, owns his own plane along with a private airstrip on the ranch. He is recognized in Texas as a Mr. Big and is respected as an honest businessman. "The money was piling up, much faster than he had ever dreamed. A few breaks, and a lot of hard work, and now he was in the clear and moving fast. No regrets." No regrets, except for the one he is about to have called to mind. On the way back from a Corpus Christi business meeting, his private aircraft develops engine trouble and his pilot is forced to land in San Antonio. While the plane is being worked on John decides to head over to the terminal for some coffee. Since he hadn't planned on stopping anywhere, he is unshaven and unkempt, wearing a pair of sweat-stained khakis, dusty boots and a ranch hat that has seen better days. Then, as he sits at a counter waiting for his coffee, he sees her. Her: the one that got away. "He felt as though his heart had dropped. She had not changed. Not at all. Funny to have been thinking about no regrets, and then the next moment see her and have the sight of her take the lid off this one little hidden regret... Gloria had come first, and he had lost her." It was fourteen years ago and John had been in the army, training in California. He and two of his friends had been dating Gloria, but John had "gained the inside track" and a wedding was planned. But Gloria was an ambitious girl, and although she was genuinely in love with John, he had little to offer her at the time. So when Major Christopher Kimball came along -- Kimball, of "the Philadelphia Kimballs" -- Gloria quickly broke off the engagement. After joining her at her table, the one-time couple begin trading histories. When John asks about "the Major," Gloria makes a face and reveals that she and Kimball were divorced soon after they were married. He went off to live in a Colorado mountain town and she headed to New York, where she met and married "a sweet boy" named Jerry Cobbler. Jerry was indeed a sweet boy, but one who refused to grow up and he eventually returned to his mother. ("Sweet boy" probably had a much different meaning in 1957 than it does today!) Husband number three -- and current spouse -- is Wendell Cowliss, a producer of some of the biggest television shows in the country. Wendell is an older man but, assures Gloria, one "young in spirit." As John listens to her he detects "tiny lines of tension" around her mouth and under her eyes. "There was a nervous brittleness in her voice. the dark hair was as glossy as ever, the soft mouth as provocative, but she seemed to be under a strain." When Gloria asks if John got "the little ranch" he used to talk about, it is clear that she has not kept up with the success of her former fiancée. He tells her yes, that he is married and has three boys, and Gloria launches into an odd reverie. "Gee, you know, sometimes I wish...I've gone this far, I might as well say it. Sometimes I wish you and I had... done what we planned before Chris came along. Wendell can buy me almost anything in the world I want... but if I could have been with you on some little ranch, working hard, raising kids, entering stuff in the county fair, driving into town on Saturday night in the pickup... I think I would have made a good ranch wife, don't you?" "A Romantic Courtesy" is a satisfying little vignette, expertly told, featuring one of MacDonald's hero types, the self-made man. He's driven but fair, hard-working to distraction but never neglecting his family, supremely self-assured yet still harboring gnawing regrets from the past. And Gloria too is a JDM "type," the beautiful but self-absorbed woman who puts her quest for a comfortable life ahead of happiness, but one who has enough self-awareness to realize she might have been wrong. In less than 2,000 words MacDonald put together the full package, a complete world leaving much to the imagination yet nothing unanswered. MacDonald was proud of "A Romantic Courtesy" and included it in his first short story anthology, End of the Tiger and Other Stories. Interestingly, there are a few extra sentences in the anthologized version, not important to the overall story but important in further establishing John Raney as an honorable man. I'm not sure if these additions were afterthoughts or if Cosmopolitan removed them for space considerations. Not a big deal, but it is rare to find alterations in republished JDM, as the author strenuously avoided revising anything he had written after it was initially published. End of the Tiger and Other Stories is out of print but used copies are easy to find. "The first-person treatment is seriously self-limiting. The "I" must say all that is in his mind and heart. There is no good way to dimensionalize that "I." All psychic reactions are flattened out. With good cause, it is rarely attempted in the serious novel. Saul Bellow attempted it in 1953 [The Adventures of Augie March]. Because he is basically a craftsman, he sustains his lead character throughout the action, but then he, too, succumbs to a curious fate, which seems typical of most of the "I" characters in fiction, particularly mystery fiction. "The character can be sustained for the length of the book, but soon the outline of the man begins to blur. Philip Marlowe, Mike Hammer -- regardless of merit in the handling, cleverness in treatment, they all blend into one faceless, characterless, depersonalized "I" remembered vaguely for only those common qualities of durability and determination. Think back to those better books written in the first person. and see how much more clearly you remember the secondary leads, those people who had the character-building advantage of third-person handling. "Yet we continue to do first-person mysteries because it is a device which simplifies the problem of reader participation in the action. We accept the self-limitation and do everything we can to sustain the lead through the book, perfectly aware that the lead will sink back into anonymity as soon as the book is closed." -- John D MacDonald, 1956, from "How a Character Becomes Believable," Chapter 15 of The Mystery Writer's Handbook, edited by Herbert Brean. Reading this made me wonder if MacDonald ever read any Jim Thompson. There's definitely no "blur" in Thompson! 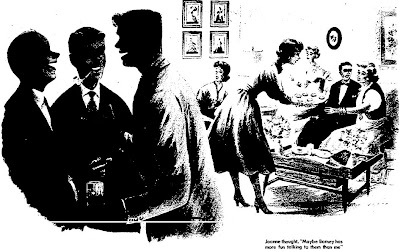 "She Tried to Make Her Man Behave"
When John D MacDonald's short story "She Tried to Make Her Man Behave" appeared in the March 7, 1954 issue of the Sunday newspaper supplement This Week, his most current novel on the stands at the time was Area of Suspicion. It's hard to imagine two more different works of fiction, seemingly written by two different authors. Yet that observation could be made for most of MacDonald's early work for This Week, where he specialized in family stories where nothing more criminal than a marital misunderstanding ever occurred. True, he would go on to write a few crime stories for the magazine -- "There Hangs Death" and "The Bullets Lied," among others -- but mainly This Week seems to have served as an outlet for the author's domesticated muse, as well as his attempts, feeble at times, for light comedy. 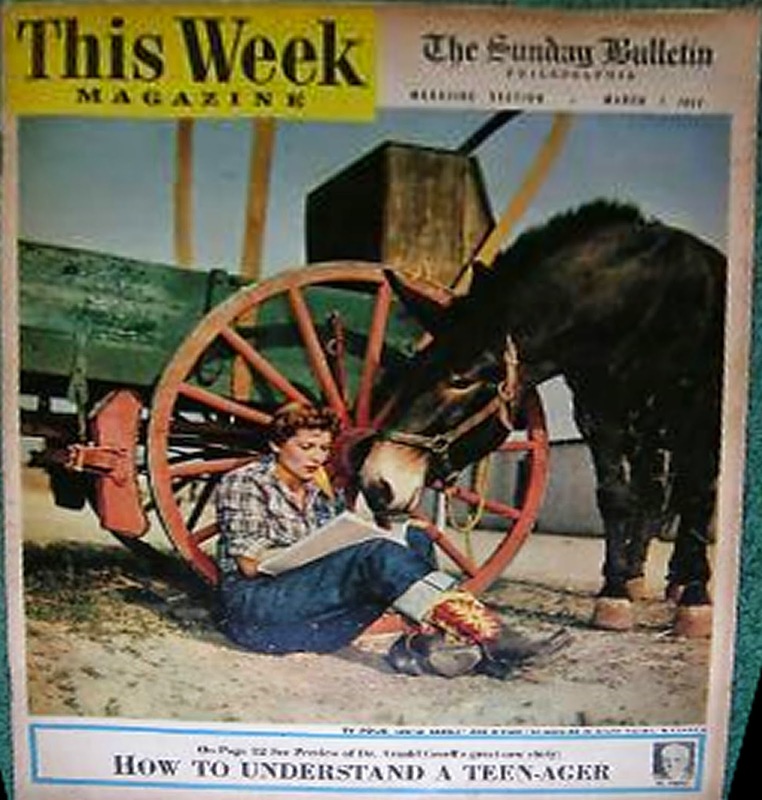 "She Tried to Make Her Man Behave" was MacDonald's sixth sale to This Week and began a year that would see three of his stories published in the magazine, up to that point the most ever. It's a misunderstanding of a different sort that brings about the moment of clarity to the protagonist of "She Tried to Make Her Man Behave." Joanne Watson has been married to Barney for a little over a year, and all things considered, it is a good marriage. Life in suburbia is going well and the Watsons have established a comfortable -- if still childless -- home in a typically Fifties environment. Barney, whose physical description fits a particular MacDonald template and reads like a blueprint for Travis McGee, works as a production engineer at a local plant "where there were mysterious machines perfectly capable of picking up a locomotive and chewing it like so much bubble gum." Petite, redheaded Joanne loves her "big-muscled, ex-fullback, ex-Marine" husband to distraction, but that doesn't mean there aren't problems... one in particular. The story opens as the couple is preparing for a weeknight dinner party at a neighbor's house. As Barney showers after returning home from work, Joanne paces the floor as she prepares her speech. When Barney emerges from the bathroom Joanne sits him down and tells him she wants " a serious word" with him. "Remember," she begins, "that the marriage book said a good marriage is a case of both people making adjustments," to which Barney replies, "That sounds as if I'm due to make one." Joanne explains that she knows how the party will go, as Barney spends the evening talking with the other husbands in another room, leaving Joanne alone on the sofa, practically "a widow." Joanne is tired of "being taken out and thoroughly ignored." "How we act here in our own home is our own business. I don't mind that dreadful snapping thing you do with the end of a towel, and I don't mind love pats that rattle my teeth, and I like to have you lift me up in the air and it is all right if you drape me over your shoulder like a -- well, like a wet towel... But you see, here in our own home you've been treating me like -- like a playmate, I guess. I like that. I think it is fine. But when you take me out -- when any woman is taken out in public -- she wants the little attentions. She wants to be made to feel -- well, precious and fragile and sort of desirable. The way Walter Furgeson treats Martha." The Furgesons, it seems, are the model of suburban marital bliss, a couple who work as marriage councilors, and they always spend these neighborhood parties together, fawning over each other. Barney doesn't think much of Walter Furgeson and lets Joanne know it. Joanne agrees to a point, but explains that "he treats Martha the way a girl wants to be treated in public... we ought to look as if we loved each other and..." Joanne can't finish and runs into the kitchen in tears. Oh, the travails of the Fifties! A chastened Barney agrees to be a good boy and the couple heads for the home of the Shubleys. Barney does his best to be attentive to his wife, gravitating to "the men" several times before remembering his vow and returning to Joanne, who is sitting on the sofa with the Furgesons. MacDonald's description of this couple is the best paragraph in the story. "Walter was a small-boned man with a narrow moustache and the delicate body-control of one of the carnivore cats. Martha Furgeson always made Joanne think of yodels, yogurt and milking stools. She had a soft blondeness, a shy eye, the warm look of the well loved. Walter treated her the way a headwaiter would treat visiting royalty, yet with a lingering personal emphasis that would have resulted in any waiter being fired on the spot. They were, in the language of the group, a special couple." Barney is up and down throughout the evening, seemingly incapable of keeping his promise to Joanne. Then, during one of Barney's frequent absences, a crisis occurs. While biting into a cherry tomato hor d'ourve, Martha manages to squirt a small amount of tomato juice onto her husband's "immaculate" white sleeve. "Don't fret, dear," sooths Walter as Martha gets up to look for something to clean the stain with. The couple disappear into the bathroom down the hall to use a stain remover when Joanne remembers a great "home-grown remedy." She heads toward the bathroom to inform Martha, but before she arrives she hears something she wasn't meant to, something that eventually changes her attitude toward "redeeming" her own husband. "She Tried to Make Her Man Behave" is a little more serious than MacDonald's earlier This Week entries -- titles like "I Love You (Occasionally),"He Knew a Broadway Star," and "What Are the Symptoms, Dear?" -- but only slightly. By 1954 the author's short story output was slowing to a crawl and the stories he did write were increasingly more mainstream than the work he had begun his career with. Now it would be the novels that would occupy his creative efforts, and he published three of them that year. He also published two novellas but only seven short stories, and three of those were for This Week. This particular story, useful perhaps to students of MacDonald's progress as a writer, is pretty much forgettable otherwise. John D MacDonald's first effort in the world of science fiction is generally dated to February 1948 with the publication of his short story "Cosmetics" in Astounding Science Fiction. And although this 4,000-word tale had been preceded by two other stories that contained aspects of unreality -- they were more fantasy than s-f -- "Cosmetics" was his first such entry in a science fiction pulp magazine. It marked the beginning of a relatively brief torrent of such works that produced ten stories in 1948, sixteen in 1949 and fourteen in 1950 before dwindling off to a mere handful. He then penned two early s-f novels before giving up on the genre almost entirely. MacDonald was living in Clinton, New York when he wrote "Cosmetics," and during that same period he authored a weekly newspaper column in the local newspaper. The following excerpt comes from the March 25, 1948 edition of The Courier, a month after "Cosmetics" appeared and two months before his second s-f story -- "The Mechanical Answer" -- was published. Reading between the lines, one can detect JDM's interest in a new market for his work, now that he had actually been published in an s-f magazine, and now that the field was -- as he termed it -- turning away from the "world of wooden men and steel space ships" and toward more "believable" stories with "oddly prophetic situations." Frequently these days we come face to face with the staggering platitude that this is indeed an odd world and an odd time to be in it. While little men in laboratories are concerning themselves with the chore of exploding our planet with all the thoroughness of a dynamite stick jammed through a decayed apple, certain segments of our population are avidly collecting science fiction which makes such a catastrophe as impressive as the blast from a cap pistol on the Fourth of July. For many years science fiction was published without attracting much attention. Wells, A. Huxley and Verne fathered the breed. In the pulp magazines, the science fiction story became nothing but a Western with space ships instead of horses, heat pistols instead of 44's and far galaxies instead of the red-rocked mesa. This world of wooden men and steel space ships rightly deserved the obscurity it achieved. But now and again a story would be published in which the writer managed to make his characters human. The more gifted writers, gifted both scientifically and artistically began to put believable people into oddly prophetic situations. In fact, one imaginative character during the peak secrecy of the Manhattan Project published a story wherein somebody fiddled around with uranium and made a bomb. If he had gotten two cents a word for every word he said to the FBI after that story was published, he would be a wealthy man. A city went up in smoke, with a flash as bright as the sun. Science fiction suddenly became yesterday's news flash. A few hundred thousand fans were acquired. The Saturday Review of Literature for February 28th, this year, carries a long editorial by Harrison Smith on this current phenomena in the publishing world. The new fans of science fiction have dug through the files of old copies of various pulp magazines, and have found therein stories for their collections. The Saturday Evening Post has published five science fiction stories within the past year by Robert Heinlein and Gerald Kersh. Good publishing houses have come out with anthologies of merit. We strongly recommend, for the curious, one called Adventures in Time and Space published last year by Random House, edited by Raymond J. Healy and J. Francis McComas. In addition five new publishing houses have recently been born, with the object of handling only science fiction and fantasy: Arkham House, Fantasy Press, Prime Press, Hadley Publishing Company and Fantasy Publishing Company. And they all sell every copy of every book! Circulation of pulp magazines in the science fiction field has grown. Sam Merwin, Jr. edits two pulps for Standard Magazines, Inc. and John W. Campbell, Jr., edits one for Street and Smith. (For the citizen who picks his magazines off the news stand arid cares what thinkle peep, the titles are the kiss of death: Astounding, Thrilling Wonder, Startling.) There are others in the field, but these three are the toppers. But In addition to this crescendo of Interest, there is one very special manifestation which could only exist in the science fiction field. The readers, the fans themselves, have banded together in groups and they publish their own magazines—called fanzines. They are usually mimeographed and they contain criticism, offers to buy and sell science fiction and some fiction. There are nearly forty of these 'fanzines' being published. There are additional ones in England. 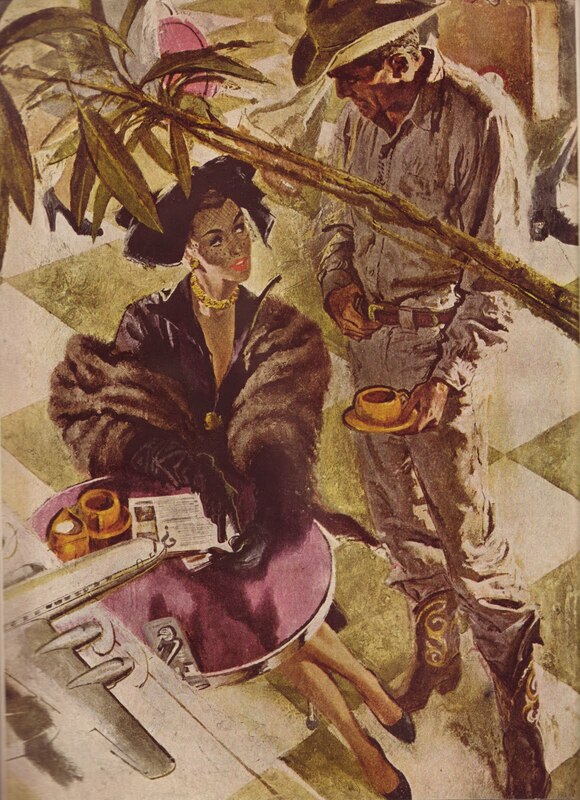 Letters to the editors of the pulp magazines come from all over the world. No other aspect of American letters Is expanding as rapidly as science fiction. So, we say, this is a strange, strange world. We are in the atomic age. If we get sharp enough with the atom, we may arrange to make this planet uninhabitable. Maybe that fear is deep in the hearts of all of us. "Don't worry, little man. When you bust up this planet, I'll buy you a new one. A nice new green one. Two hundred light years away." 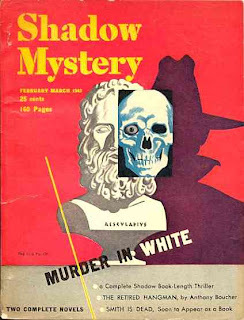 "Backlash" is an early John D MacDonald short story, one of two that appeared in the same February 1947 issue of The Shadow, or Shadow Mystery as it was called that year. As was the custom of the time, only one of these stories would be published with the author's real name, so one of them had to be credited to a house name. "Backlash" was the one and it was attributed to "Peter Reed." One assumes that the author had some say in which of his stories would have his name on it, just as one assumes that said author would select the story he was most proud of. 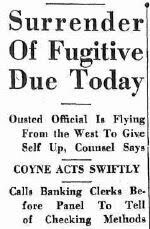 And although that didn't always seem to be the case (see my piece on "Five-Star Fugitive") it certainly was for this particular issue. The other story -- "The Anonymous Letter" -- while not a classic, is an interesting and well-done tale whose power lies in its ability to evoke time and place. "Backlash," on the other hand, is a simple yarn about cosmic justice that contains both an ironic, twist ending and a highly unusual would-be murder weapon. In fact, said weapon is so obviously a plot device that the reader immediately begins wondering about it once it is introduced. Like its companion piece, "Backlash" contains a character who spent World War II in the China-Burma-India Theater and that military stint has a direct bearing on the plot at hand. Both tales also feature men who are damaged romantically, undone by a woman upon whom they attempt to take revenge, and both feature unusual methods used to carry out their plans. "Dear Ralph, I don't know what you mean. I never made promises to you. Because Karl was blinded is no reason why I don't marry him. The doctor says maybe someday he will see again. Please don't bother me any more. I love Karl. Don't try to see me. Your letter frightened me. Bess." Whenever Ralph thinks of Bess with Karl he hears a roaring noise in his ears, and he has resolved that if he can't have her, no one will have her. Ralph returned home with more than just a hope for Bess' attentions. He was also packing an unusual weapon, a homemade crossbow, purchased from "a Naga man from the hills" for a mere three rupees. He has spent weeks practicing with it, while living in a transient camp, and can now sink an arrow accurately from sixty yards. He plans to use his newfound archery skills and has one arrow named for Bess and another for Karl. As the story opens, Ralph is checking into a hotel, making a scene as he insists on a room on the north side and only one or two stories up. His request granted, he enters his room, locks the door and quickly checks out the scene from the window. Across the street is a sidewalk cafe, easily within shooting distance. He then heads for a local drugstore and make an improbable call to Bess, disguising his voice with a handkerchief over the mouthpiece (does that trick even work?) He pretends to be an old army buddy of Karl's named Fowler and sets up a lunch date for the following day at the cafe next to the hotel. When Bess makes sure that the caller knows of Karl's handicap, "Fowler" responds, "Sure. I won't make any breaks. I hear he is going to be okay though." He tells her to select a table outside. Ralph spends a fitful night of light sleep, his bravery supplemented by a bottle of cheap rye. The following day both Bess and Karl arrive at the cafe on schedule. Ralph takes a last slug of the rye and aims the crossbow at Bess, first at the V of her dress, then at her throat. "There could be no mistake -- or Karl would have her. No one must have her." Outside of its characteristic economy of words and the past life of its protagonist, there is little in "Backlash" to reveal it as the work of John D MacDonald. In early 1947 he had only been writing for a little over a year and had been published for barely that long. Much of his very early work reveals a writer searching for a style, one who was perhaps unsure of which particular field of fiction he would specialize in. The basic plot of "Backlash" could have come out of any comic book or cheap pulp magazine of the period and it was undoubtedly an effort MacDonald would have wanted to forget. Still, it's a brief diversion with some interesting techniques and a few telltale attempts at what would become his characteristic "voice". 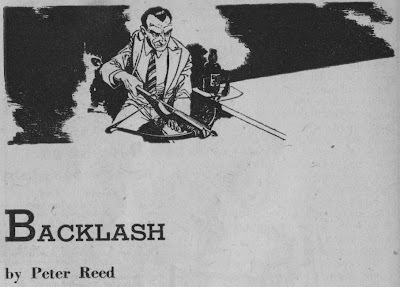 At 1,200 words, "Backlash" would have earned the author around $24 -- assuming the standard 2-cents per word that most pulp writers were paid-- which seems about right for this tale. Something he probably knocked off one morning before lunch. Mr. and Mrs. Willard G. Teed, newlyweds living miles apart and who possibly never did live together, were not mentioned in any of the newspaper accounts of Leonard Teed's crimes. Since (according to Hugh Merrill) Bill Teed was living with his parents, one would think he would at least be referred to in one of the sometimes-colorful articles that appeared in the Yonkers Herald Statesman, but that does not seem to have been the case. His somewhat cryptic remark in his handwritten note to Dordo the previous May ("I will fix it up with you later.") was probably a reference to an agreed upon divorce between the couple, for in early September -- only two weeks after Leonard Teed was transferred from Sing Sing to a minimum security prison in Wallkill -- the couple was in Reno, Nevada and the papers that would put an end to their marriage were filed in the local courts. It seems probable that the divorce had been planned for that summer when School was out and Dorothy could afford to be away from Cazenovia Seminary for the necessary six weeks of Nevada residency required by the state. But the trial had intervened, and once it was over the couple was free to put an end to their very brief marriage. Assuming there were no problems or delays, the final divorce would have been granted in the middle of October 1933. 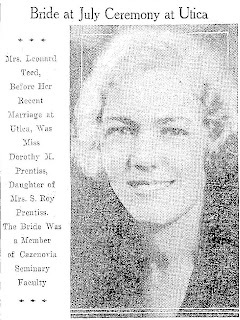 The timing of the proceeding likely meant that Dorothy didn't teach at Cazenovia Seminary in 1933-34, and Merrill is unclear what she did afterword. Two years after the divorce it was announced in the Yonkers newspaper that Willard Teed was engaged to one Williamina Ramsey of Scarsdale. No date for the future nuptials were given and I have been unable to find any record of a subsequent marriage, although one certainly took place. Leonard Teed became eligible for parole in December 1939, and applied for his release from prison at that time. Despite the fact that he was considered a model prisoner his request was denied. (How does one not become a model prisoner in a "prison country club"? By complaining that the quiche is curdled?) The parole board ruled that he must serve out at least the minimum sentences, minus time off for "good behavior." Less than two years later, in October 1941, Leonard Teed was released on parole, having served a total of eight years and three months of a possible twenty-year sentence. Now 65-years old, Teed's release was mentioned briefly in the local newspapers, where it was reported that he would be employed at an "upstate camp" in an unnamed New York location. His wife Helen, who had continued to live in the family's White Plains home, joined her husband. At that point Leonard and Helen Teed disappear from the newspapers, but not from other available records. 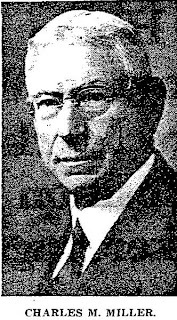 In 1944 Leonard E. and Helen U. Teed appear in the city directory of Saratoga Springs, New York, a town 175 miles north of White Plains and presumably far enough away for them to be unrecognized by any former neighbors. Leonard got a job as the manager of Steiner's Store, a paint and wallpaper retailer, and the couple lived in a rooming house along with five other tenants at 119 Caroline Street. Sometime between 1944 and 1946 Helen passed away, finishing a life that almost certainly didn't end the way the former tea party hostess and DAR member thought it would. 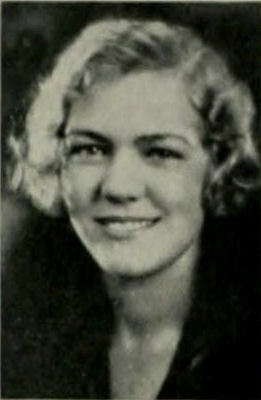 Leonard quickly remarried, to a woman whose first name was Jean, and they are listed together in the city's 1948 directory. They are also listed in the 1950 directory, the last record of Leonard Teed I have been able to uncover. He was 74-years old, still married to Jean, still managing Steiner's and still living in the rambling, Victorian rooming house he and Helen occupied when they first moved to town. Neither Leonard or Jean appear in the city's 1952 directory. I'm fairly certain that son Willard eventually married Williamina Ramsey. He found his way into the United States Air Force and reached the rank of Colonel, stationed in the Materiel and Operations Branch in Binghamton, New York. A 1961 newspaper account lists him as "deputy chief of staff, materiel, First Region." He and Williamina retired to Florida and lived in Zephyrhills, a suburb of Tampa. Willard died at the age of 71 in May of 1980, and Williamina followed him four years later, passing away in January 1984 aged 75. One wonders if either Bill or Dordo knew that they were living 75 miles from each other at the time of his death. Dordo did quite nicely herself. A few years after her marriage to Teed she would look back on that brief period of her life with bemusement, remembering her first husband as "just negative." Merrill quotes her from a letter she wrote where she wonders "...how [someone like Teed] gets in your story anyway." She went on to write that he was never "part of [her] and ... never aroused any great emotion -- except relief from something." She was still in the Syracuse area -- possibly still teaching art at Cazenovia Seminary -- in 1936, three years after her divorce. She had reclaimed her maiden name, so it was Dorothy Prentiss who walked into Fisher's Restaurant in downtown Syracuse in March of that year to be waited on by a tall, blonde, bespectacled college student named Jack MacDonald. The literary world of America would be changed by that meeting. I wrote in part one of this piece that without Dorothy MacDonald there would be no John D MacDonald writings. Having studied the life and work of JDM, I am reasonably confident in that assertion. John was an artistic soul born to a stern, disciplinary father, a businessman who expected his only son to follow in his own footsteps. John struggled all of his young life trying to find something to do with his life that would make him happy and fulfilled. A lover of the written word, he longed to be a writer but feared that writers, like priests, were born to the vocation and his attempting to "be one" would be revealed as pretense. It took the love and support of Dorothy Prentiss, an artist with an artist's sensibility, who came from a family of "art crazy" people, to provide him the encouragement to do what he always wanted to do. Reading the few wartime letters that Hugh Merrill quotes in his biography reveals the fact that John's desire to write was not a secret he kept to himself. And it was not, as the famous legend goes, something he merely knocked off because of military censorship. 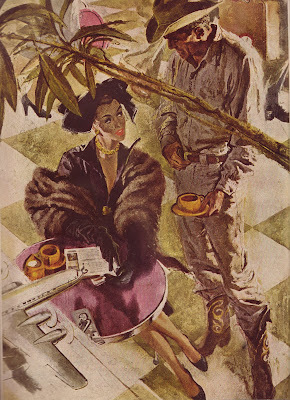 Dorothy's secret submission of "Interlude in India" to Story magazine was only the most obvious act in her role of allowing John to become a writer. In the long run, it was the confidence she had in his abilities, the encouragement and support she gave him, the courage to persevere even through the worrisome beginning months when the money almost ran out, that marks her most important contribution to the role of JDM the writer. Her name never appeared on the cover of any book, but without her, neither would have John D MacDonald's. An interesting postscript. In 1951 MacDonald published his fourth novel, a violent thriller titled Judge Me Not. The hero was named Teed Morrow, a man who worked for a city manager hired to weed out an utterly corrupt political administration. Teed was a good guy, although he liked to sleep around with the wrong women, and he didn't control public monies or estates, but his first name simply can't be a coincidence. The town is clearly located someplace in upstate New York. Perhaps MacDonald was only using a cool-sounding first name drawn from his wife's past, perhaps he was playing a joke, or perhaps he was trying to communicate something deeper. It's a question that needs to be left for further research. On April 29, 1933 Westchester County Deputy Treasurer Leonard Teed and his superior, County Treasurer Charles M. Miller, had "words" over something in Teed's accounts and his resignation was demanded. Teed quit the following day and left White Plains with his wife Helen for a vacation. Teed's primary responsibility in the County Treasurer's office was the management and disbursement of estate funds. When a county resident died his or her liquid assets were held by the county until all applicable estate taxes could be paid to the county and the state. After Teed left, his accounts were taken over by an acting Deputy Treasurer, who immediately discovered a total mess. A quick audit was done, the result of which revealed total funds in the amount of $248,000 missing from the County bank accounts. Needless to say, this was serious money, especially in the teeth of the Great Depression. When it was learned that Teed had left town, all hell broke loose. Ten days later a grand jury handed down an indictment for grand larceny, specifying only one of the nearly eighty estates that were missing funds. The Teeds were supposedly out west somewhere but had obtained the services of a local attorney, who appeared at the hearing and promised to arrange Teed's surrender later that day. He told the court that his client was flying in that morning from an undisclosed location in a western state and would be staying at an unnamed New York City hotel, where he would be fetched and brought back to White Plains. According to the District Attorney, Teed had been pilfering the accounts of decedents' estates for twelve years, ever since private estates began being administered by the Surrogate Court. Teed had somehow managed to negotiate checks made payable to the county and convert them to cashier's checks made payable to himself, which he would then cash at various banks around town. It was presumed that he had at least one accomplice at one of the banks, but that seems to have never been proven. What the money was used for was unknown at the time of the indictment, but the DA promised to find out. The means of carrying out his defalcation was made possible by an incredibly sloppy system of checks and balances that were never enforced, to the point that in his 35 years of service as Deputy Treasurer his accounts had never once been audited. He robbed one account, then replaced the stolen loot with the funds of a different estate. People were always dying, and in Westchester County they died with heavy estates, so there was always new money coming in to replace the old. Teed must have known that his theft would be discovered the minute a new set of eyes looked at his accounts, which is probably why he headed west. In fact, the couple had really been hiding out for the past week at the Hotel White on Lexington Avenue in New York City, registered under the name Stevens. They spent the week going to movies and eating out at restaurants and, according to one newspaper account, "making no effort to avoid his pursuers." Someone had tipped reporters about his whereabouts on the day of his return and they flooded the hotel lobby waiting for him and his wife to come down the elevator. Teed was made aware of this and snuck out a service elevator. He and his wife stood out on the sidewalk behind the hotel for over an hour awaiting the arrival of Teed's lawyer to pick him them, chatting occasionally with a local policeman. He arrived at the courthouse in White Plains to a mob scene. In addition to the dozens of reporters standing outside, scores of county employees who had known and worked with him for years had left their posts to run over the the courthouse and witness the spectacle. The presiding judge was an old friend, as was the DA and several members of the grand jury. Teed hid his face underneath his derby and "appeared near collapse" as he entered the courthouse. There the indictment was officially delivered and a bail hearing was set for the following day. He was immediately taken to the county jail, where he stayed until his eventual trial. The bail hearing would prove meaningless, as Teed was broke and had no way to meet any sort of bail that might have been set. When the initial hearing was held and the charges for one of the estate defalcations were made, Teed pleaded not guilty. As May passed into June, more charges were brought as the audits uncovered more and more estates affected by Teed's theft. On June 7 he was brought back to court to plead on an additional seven counts, but his attorney managed to get an adjournment until the following day. A newspaper described the 57-year old Teed as "crestfallen and aged" as he witnessed the pleading of another colleague who was indicted on a similar charge. Teed's long stay in the county jail was having an effect on him and he began hallucinating, becoming convinced that his jailors were attempting to kill him by poisoning his food. He began a hunger strike and managed to get the court to agree to allow Teed's wife Helen to bring him a glass of orange juice from home each morning. The newspapers surmised that he was preparing an insanity defense. Meanwhile, the pressure from estate beneficiaries became enormous. At one point over 150 lawyers representing nearly eighty plaintives were suing the county in an attempt to recover stolen estate assets. The County Treasurer, 69-year old Charles M. Miller, was serving his third term in the office after having just won his third election to the post and was, under the law, civilly responsible for the losses caused by his deputy. The fact that he was personally bonded did little to relieve his own fears that he would somehow be tainted by the crimes. That fear was made more real on June 8, when the adjourned hearing took place and Teed's attorney promised "...there will be highly sensational disclosures on the trial. I can not say any more right now." It was widely assumed that Teed had accomplices, but their identities were unknown. Anyone who worked in the county government had reason to fear that they might be dragged into the proceedings, much as the dozen or so bank tellers who had cashed Teed's checks had, testifying at the initial indictment hearing. Teed pleaded not guilty to all charges, and a trial was scheduled for June 14. The trial never took place. One day before that scheduled date, Teed and his attorney appeared before the court and Teed admitted guilt to all of the charges against him. It is impossible to know if the fears of bringing additional county employees into the mess caused certain people in power to come to some kind of backroom agreement, but as we shall see, Teed's punishment did not exactly fit the crime. On July 5 Teed was sentenced for only two of the eight incitements brought against him, and given the maximum sentence of five-to-ten years for each count, to be served consecutively. His lawyer assured the court that no other county officials would be dragged into any subsequent defense of his client. 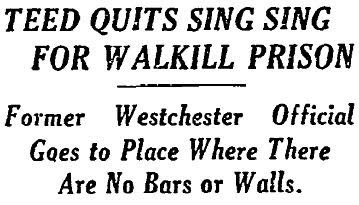 Teed's destination was Sing Sing Prison in Ossining. If he were to receive parole on both counts he could conceivably serve a mere eight years for stealing a quarter of a million dollars, taken literally from widows and orphans. The additional six indictments were dropped and, while his expected pension was stopped, he was not required to repay any of the funds he had stolen. Which was probably good, for there was nothing left to return. Although it was never specified in any of the newspaper reports of the scandal, it was hinted that most of the money was stolen to invest in the stock market. 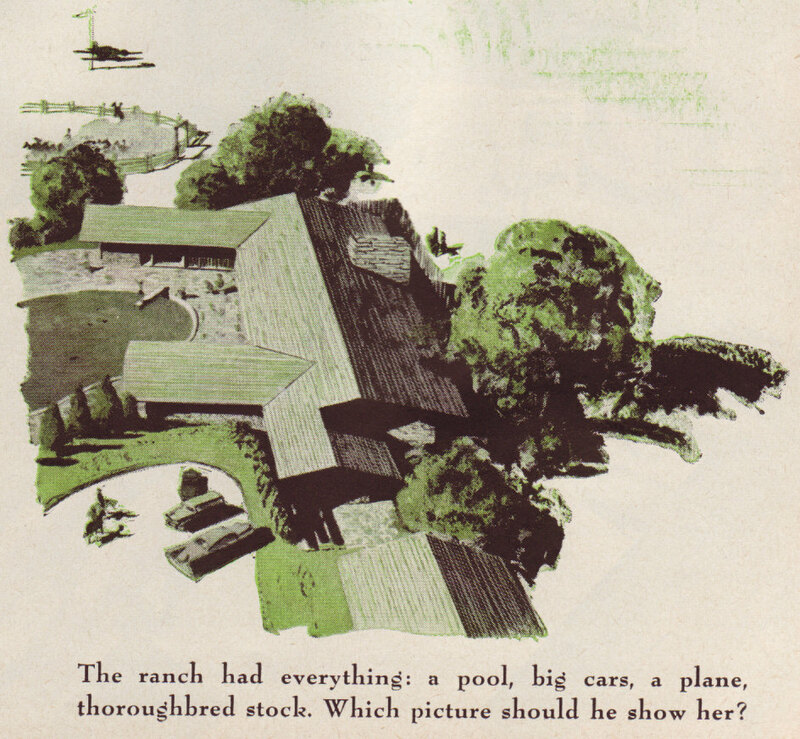 The lure of a steadily rising market in the 1920's probably convinced Teed that he could easily "borrow" funds from an estate, make a quick gain, then return the money before anyone discovered what he had done. This may have worked fine until October 1929 when the market crashed and fortunes larger than Teed's were wiped out. At that point it became a never-ending process of robbing Peter to pay Paul in an attempt to keep from being discovered. His sudden departure from his post in the Treasurer's office after a verbal altercation with his boss was the tipping point from which he could not return. He probably knew what was in store for him and took what little money he had left to treat his wife to a week on the town in New York City. With Teed off to prison, it was left to his former boss Charles Miller to fight a rear guard action in an attempt to keep himself out of trouble. On July 11 he appeared in Surrogate Court to defend himself against any possible personal liability. He was allowed to obtain application to submit new accounting for eight of the estates that had been robbed, with a promise to submit seven more when they could be sorted out. Miller's personal liability in all of the cases was covered by bonds, and "practically all" of the companies that had issued these indemnity bonds were thought to be in good condition. Recall that this scandal took place in what is widely believed by historians to be the worst year of the Great Depression, and many, many insurance and indemnity companies had gone under, leaving their policy holders naked to liability. That concern, in addition to the total weight of this whole affair took its toll on Miller. On August 20, after having dinner at his summer home in Winstead, Connecticut, he suffered a massive heart attack and died instantly. The New York Times account of Miller's death dryly mentioned that the Teed affair was "believed to be a contributing factor" in his death. The very next day, after serving a total of 46 days in Sing Sing, Leonard Teed was transferred to a minimum security prison in Wallkill, New York. Known as The Wallkill Institution, the facility was originally intended to serve as a "place of rehabilitation" for young prisoners and contained no walls or bars anywhere. The New York Times contemptuously referred to the place as "a prison country club." (And I thought that term originated with Watergate!) The newspaper also noted Miller's death the previous day, as well as the fact that Teed was the third Republican officeholder convicted of stealing public funds who later transferred to Wallkill. Of the four books that have been written about John D MacDonald (five, if you count his own The House Guests), only one of them is a straightforward biography. The first two to appear were critical studies of the author's work that contained first chapter biographies, drawn heavily from the few bits of biographical information MacDonald provided in The House Guests. The most recent -- Lewis D. Moore's Meditations on America -- doesn't even go that far, instead providing bits of JDM history throughout to illuminate his book-length study of the Travis McGee series from a sociological perspective. Only Hugh Merrill's 2000 The Red Hot Typewriter is a real biography, and it will have to do until something better comes along. (Does anyone know the fate of the yet-to-be-published Bloodshot Rainbow?) It's a deeply flawed and rather lazy effort that nonetheless contains some interesting revelations that have been written about nowhere else. I discussed a few of these in my previous posting on the book, yet I didn't mention one that could have come straight out of one of MacDonald's novels: the first marriage of MacDonald's wife Dorothy and her connection to a sensational crime that involved the theft of a quarter of a million dollars. It was a brief union that ended spectacularly, yet Merrill only gives the story four paragraphs. I've been doing my own research and I am now able to flesh out the story considerably from Merrill's initial account. And lest one think that this tale of love and embezzlement has nothing to do with the work of John D MacDonald, I would remind the reader that the single most important person in the life and work of the author was his wife. Without Dorothy MacDonald there would have been no John D MacDonald writings. 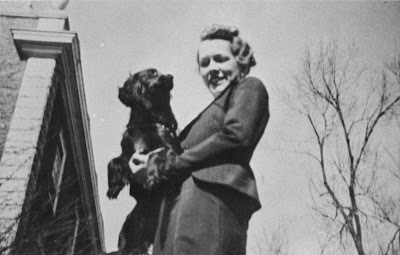 Dorothy Mary Prentiss was born in Poland, New York, a tiny village near Utica, in 1911. She was the eldest child of Samuel Roy and Rita (Van Woert) Prentiss, a couple who had met while attending Cazenovia Seminary, a small but distinguished prep school that was an early pioneer in co-educational learning, located 20 miles southeast of Syracuse. Roy (as he was known to all) worked as a clerk in a Gloversville dry goods store, but before 1918 the family had moved to Poland. Merrill, relying on accounts written by the MacDonalds, states that Roy was an entrepreneur who quickly left the employ of others and established his own "department stores" in two upstate towns, but records from 1918 and 1920 indicate that he was still an employee. His 1918 draft records list him as a dry goods "clerk" and the 1920 Federal Census reports his occupation as "salesman." Sometime in the early 1920s, according to Merrill, he "sold his stores" and moved the family to California, where he engaged in oil speculation and aviation. Ed Hirshberg's biography claims he also was involved in the citrus industry, where he achieved "substantial success." But in 1926 he contracted typhoid fever and died, whereupon his widow Rita moved her two teenaged children back to upstate New York. Dorothy, who was known to everyone by her nickname "Dordo," had been interested in art from a young age, so when it came time to attend college she entered the College of Fine Arts of Syracuse University and majored in the subject. She led an active student life, joining a sorority (Delta Delta Delta), working with City Woman's Club, singing in the Glee Club (the Woman's Glee Club) and serving in the Woman's Congress. It was there, also, where she met her future husband, a White Plains native and the son of the Westchester County deputy treasurer, Willard Golding Teed. He was a member of the class behind her yet was actually a year older than Dordo. They were, according to Merrill, "an item." Willard -- who Dordo called Bill -- was the son of Leonard and Helen (Uptegrove), both Westchester County natives who had married in 1902 but who had not produced an offspring until eight years later. Bill was their only child, and he was attending Syracuse as a Business Administration major, following in the footsteps of his father who had served in the Westchester County Government for over thirty years. Leonard Teed was the son of a harness maker who had died before Leonard reached the age of twenty. In 1900 he was 24-years old, still living with his mother and employed as a clerk in a grocery store. Two year later he married Helen Uptegrove, the daughter of a prosperous dairy farmer who, like her husband's father, had died when she was in her teens. They continued to live with Leonard's mother and, in 1909, Helen gave birth to Willard. Sometime before their son was born, Leonard managed to obtain a job with the Westchester County government as an Assistant Treasurer. Westchester County, New York was then, as it is today, one of the wealthiest counties in the United States. With its close proximity to New York City it evolved into the the archetype of every major city's upper-class suburbia, full of golf courses, country clubs and young professionals who made the daily commute by train to work in the big city. The completion of the Bronx River Parkway in 1925 further expanded the county as one of the first bedroom communities in the country, and much wealth poured into its borders. It was the basis for what became known as "Cheever Country," and the Teeds seem to have enjoyed every bit of that nouveau status. When Leonard's mother died after 1910 they sold her home and purchased a new, more tony address at 45 Park Avenue in White Plains. Leonard, in addition to his duties with the County government, also served as the secretary and treasurer of the city's largest music emporium, Hunts Leading Music House. Helen was a member of the local chapter of the DAR and held teas and other events that were commented on frequently in the society pages of the New York City newspapers. Life was good. The fact the Bill entered Syracuse University two years behind his age group could mean a lot of things. Perhaps he had attended and flunked out of another, more prestigious college, perhaps his primary education took longer than it should have, or perhaps he simply bummed around for a couple of years after high school. The particulars of his romance with art student Dordo are lost to time, but it was evidentially serious enough to result in a quick marriage. Dordo graduated in the spring of 1931, Bill in 1932, and they were married in June of that year. Dordo was not idle in her year between her own graduation and marriage. She applied for a teaching position in the art department of the school where her parents had attended and met, Cazenovia Seminary. She was accepted before she had even graduated, under an agreement that she also teach elementary French. Since she had never taken courses in the language, she had to quickly learn. She began her teaching career while her fiancée finished his senior year at Syracuse. 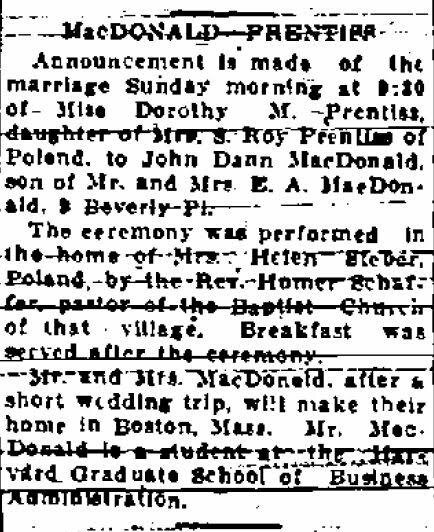 The wedding, as reported in the Syracuse Herald, was a modestly tasteful affair that took place in the home of Dordo's aunt and uncle in Utica. The ceremony was performed by the Syracuse University Chaplin William Powers and the bride was given away by her uncle. Dordo's bridesmaids all seem to have been fellow students and the best man was not a friend of the groom, but Dordo's younger brother Sam. And after the honeymoon -- which, according to Merrill's account was to have take place at Piseco Lake -- the couple was planning on making their home in Utica. The fact is, they never made it to Utica. Merrill tells us that Dordo returned to teach at Cazenovia Seminary that fall and Bill returned home to live with his parents in White Plains. Something obviously happened at Piseco, or over that summer that led to a dissolution of the marriage. And while it is uncertain to what extent any communication between the couple took place, there was one brief correspondence from Bill in May of the following year that would prove earth-shaking, for him at least. He sent Dordo a clipping from the New York Herald Tribune along with a brief note. The clipping revealed that the Westchester County accounts of Bill's recently-retired father had been audited and a shortage of $250,000 was discovered. Bill's unsigned note read, "God only knows what will happen but it looks as tho it is prison for him unless he slips out. I was never so disgusted in my life. I will fix it up with you later."